With a pan for every oven cooking task, it’s easy to enjoy the nonstick baking performance of the hard-working, easy-cleaning, Vremi Bake-A-licious Baking Sheet Set. Perfect for toasting, roasting, and baking everything from traditional cookies to flavorful lamb racks, with no burnt or under-baked spots. 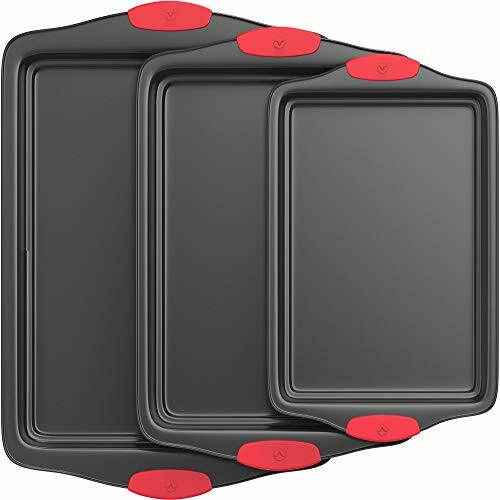 Each small, medium and big sized baking pan is made of heavy-duty, food-grade, nonstick carbon steel designed with fully rimmed sides and wide textured, red silicone ergonomic handles. With 1/2 inch deep rolled edges for extra strength, the sheets are great for goodies like mini cakes, chocolate brownies and toasted bacon or pizza from the oven. The nonstick coating inside and out is safe and durable, making the pans scratch and rust resistant while providing an excellent release of baked goods without a mess. No baking liners, mats, or covers needed—just add your sweet treat and pop the tray in the oven. Hand washing is recommended for all parts. Bake healthy, homemade treats quickly and efficiently with these 3 versatile cookie sheets. CAUTION: Hot surface. Do not leave bakeware unattended. WARNING: This is not a toy or weapon. Keep out of reach of children. Do not put in microwave, dishwasher, freezer or above a direct heat source. If you have any questions about this product by Vremi, contact us by completing and submitting the form below. If you are looking for a specif part number, please include it with your message.